Except that heavy, record lake effect snows are a sign of global warming. The heavy snow in the Great Lakes area ends around early or mid-January, most of the time, when the ice cover gets to its greatest extent. Erie and Ontario freeze over, and so there's no moisture to pick up when the cold Canadian air comes across the lake. As long as the water is warm, though, the snow machine forms. And so, what we are seeing now is record lake-effect snow long after the time that it should be shut off and the lakes frozen over. But Lake Erie hasn't frozen over completely for going on three winters now. So Erie, PA sees a 60 inch Christmas Day snow, a record for 24 hours, and the lake has a long way to go before it freezes over. And if you want to read about the effects of global warming in the places where warm temperatures are the main attraction of the local geography, here's some additional information. Written as if by a true GW believer. Church is in session for 2018. I’m not going to chase the global climate rabbit. But yep, it is darn cold up here right now. But Iowans just go on. We attended a brunch this morning at 9:30a with some church members while it was still below -15. It is cold up here often enough that if we don’t just get on with it, we’d never leave our houses. We are getting to the point, after eight years, where the cold and snow don't bother us much. On December 8, while coming home from Buffalo, I drove through about 50 miles of a lake effect blizzard between Angola, NY and Erie, PA at almost zero visibility and at less than 20 mph most of the way. Eight years ago, I'd have found a hotel and stopped. I just thought it was interesting that while we're seeing this massive, lake effect snowfall caused by a warmer than normal Lake Erie, due to mild winters and warmer than normal summers, in my hometown in Arizona, they're talking about the average temperatures being significantly higher than normal over the same period of time, with a much different effect. In Arizona, it was dry conditions, and unusually large and widespread wildfires, while here, it's lake effect snow. You can draw your own conclusions, there are two articles there, based on scientific measurement, that explain why. Yeah, it seems pretty clear that global warming (which can eventuate in local snowstorms) is reality. I'm still not at all sure to what extent it's human-carbon-release driven, though certainly to some extent, and I'm not sure what the best response is, how best to deal with it. All this talk about GLOBAL Warming with what is happening in Tucson or Western NY is pure nonsense. The last three years have been the hottest GLOBALLY by all measurements. Scroll to bottom and look under the D-N (Dec-Nov). Since the Industrial Revolution the GLOBAL temperature has risen over 1.2C = 2.16F. When the Dec 2017 measurements are analyzed the 2017 dot will appear well above the “Best Linear Fit (1970-2017)”. Even “skeptic” John Christy who spoke to our Science and Religion Lecture Series at the Discovery Center says the growth in human CO2/ghgs emissions and deforestation are contributing to global warming. He just doesn’t think this rise will amount to bad consequences and was adamantly against any regulation on our “proven” capitalistic system. Much more to say but I’ll spare you. I agree with I your completely Keith. I just know that no one here seems to change their mind. Tim Bonney wrote: I agree with I your completely Keith. I just know that no one here seems to change their mind. I know. If you have noticed, I have scaled back with the data driven info I provide here since no one seems to be impressed with facts (and it takes time). Latest example, no reaction to the income tax cuts being concentrating on high incomers ($500-$1600 for the middle class, $90,000+ for those over $3.4M in income). KeithE wrote: I know. If you have noticed, I have scaled back with the data driven info I provide here since no one seems to be impressed with facts (and it takes time). Latest example, no reaction to the income tax cuts being concentrating on high incomers ($500-$1600 for the middle class, $90,000+ for those over $3.4M in income). I have always appreciated your charts even when I’ve not read each and every one. It would be nice in this current Trumpian climate if facts rather than tweets etc. were what people were basing opinions on. The new tax law is just appalling. Yet I’m not seeing nearly the outrage it deserves. Most people don’t seem to have even read or checked into what is being cut and who is getting what. My favorite cold snap quote: "It's so cold in Washington, politicians have actually been seen with their hands in their own pockets." Now that's funny -- though perhaps a bit too optimistic! KeithE wrote: Even “skeptic” John Christy who spoke to our Science and Religion Lecture Series at the Discovery Center says the growth in human CO2/ghgs emissions and deforestation are contributing to global warming. He just doesn’t think this rise will amount to bad consequences and was adamantly against any regulation on our “proven” capitalistic system. Notwithstanding all the charts, graphs and other data, it may be that people are beginning to understand that the climate does not respond to anything man is arrogant enough to believe he does, other than try to control air pollution, but to the natural cycles that have obtained since time immemorial. Atmospheric CO2 is controlled primarily, if not exclusively, by the earth's oceans, seas, rivers, whatever...74% of the earth's surface. These entities capture the CO2 emitted by the earth's trees and plants, store it and regurgitate it when Nature calls, thus climate-change or temporary fixes. The other deciding factor is sunspot activity on the sun, which seems to be particularly operative currently. The man-made arrogance has been a political ploy from the beginning, has been thoroughly discredited, especially by the highest-profile “experts” shooting themselves in the feet (those condemnatory emails of 2009) and the citizens have moved on. Jim wrote: Notwithstanding all the charts, graphs and other data, it may be that people are beginning to understand that the climate does not respond to anything man is arrogant enough to believe he does, other than try to control air pollution, but to the natural cycles that have obtained since time immemorial. Atmospheric CO2 is controlled primarily, if not exclusively, by the earth's oceans, seas, rivers, whatever...74% of the earth's surface. These entities capture the CO2 emitted by the earth's trees and plants, store it and regurgitate it when Nature calls, thus climate-change or temporary fixes. The other deciding factor is sunspot activity on the sun, which seems to be particularly operative currently. The man-made arrogance has been a political ploy from the beginning, has been thoroughly discredited, especially by the highest-profile “experts” shooting themselves in the feet (those condemnatory emails of 2009) and the citizens have moved on. David Flick wrote: The notion that that cold & snow are caused by ‘global warming’ is insanity. It's Witchcraft. That's not what was said at all, that's your own misquoted straw man. Nor does the statement that you cited from the meteorologist support your statement. And his statement is also a straw man, because the claims of global warming don't "tell the public that events that have occurred countless times before with no climate change attribution is now just that, it is not science, it's witchcraft. No proof at all, it is climate ambulance chasing, nothing more." That's also a straw man, and notice, that while it is citing a meteorologist, it is a meteorologist claiming there's no proof, but not citing any proof to substantiate his own opinionated statement. Snowfall in general, and lake effect snow fall along the Great Lakes in particular, are precipitation events, not cold events. Increased snow isn't produced by increased cold, it is produced by increased moisture content in the atmosphere. Lake effect snow along the Great Lakes happens in late fall and early winter, when the air temperature is warmer, and the majority of the water in the lakes hasn't frozen. The record lake effect snowfalls of the past decade or so have all been due to lake water temperatures warmer than normal, and air temperatures warmer than normal. This allows the atmosphere to absorb a greater amount of water vapor, and produce greater amounts of snowfall in the snowbelt areas along the lakes. The temperatures and snowfalls aren't "events that have occurred countless times before." The recent events are records, and significant ones at that. So is the heat and drought in the Southwest. Jim did get one thing right. It is political. Denialists have bought into corporate paid-for propaganda and crackpot science, and that perspective is most definitely political. It's a choice between the charts and scientific data researched by science and provided by an engineer, or some straw man arguements lifted out of extremist right wing fake media sources. Or in Jim's case, just his own narrative, without any citation, even of the crackpots. Keith and his charts offer real proof. Sandy wrote: That's not what was said at all, that's your own misquoted straw man. Nor does the statement that you cited from the meteorologist support your statement. And his statement is also a straw man, because the claims of global warming don't "tell the public that events that have occurred countless times before with no climate change attribution is now just that, it is not science, it's witchcraft. No proof at all, it is climate ambulance chasing, nothing more." That's also a straw man, and notice, that while it is citing a meteorologist, it is a meteorologist claiming there's no proof, but not citing any proof to substantiate his own opinionated statement. Jim did get one thing right. It is political. 1Denialists have bought into corporate paid-for propaganda and crackpot science, and that perspective is most definitely political. It's a choice between the charts and scientific data researched by science and provided by an engineer, or some straw man arguements lifted out of extremist right wing fake media sources. 2Or in Jim's case, just his own narrative, without any citation, even of the crackpots. 3Keith and his charts offer real proof. Atmospheric CO2 is controlled primarily, if not exclusively, by the earth's oceans, seas, rivers, whatever...74% of the earth's surface. These entities capture the CO2 emitted by the earth's trees and plants, store it and regurgitate it when Nature calls, thus climate-change or temporary fixes. The other deciding factor is sunspot activity on the sun, which seems to be particularly operative currently. Algore and his pseudo climate scientists have spent decades spreading false information (denying the facts) about the effects of CO2 and sunspot activities. 3 The AGW alarmists are the only people who accept Keith's charts as being factual proof. And so, what we are seeing now is record lake-effect snow long after the time that it should be shut off and the lakes frozen over. Sandy, I'm having trouble comprehending your timeline. You say they are seeing record lake-effect snow long after the time that it should be shut off, but you also say it ends around early or mid-January. So I don't understand what happened in late December was "long after" mid-January? Thanks. This year's record lake effect snowfall in Erie was the result of higher than normal lake water temperatures, and much less ice cover than normal early in the winter. The record lake effect snows over the past decade or so are a separate event from the December records set in Buffalo a couple of years ago, and Erie this winter. Both caused by the same thing, though. Lake Erie was warmer than normal, and less frozen over than normal in December, and that produced the lake effect snow event that started around the 6th of December near Buffalo, and that I drove through on the 8th. That storm put down more than 4 inches an hour around Fredonia, NY, and a couple of weeks later, dropped 60 inches on Erie in 24 hours. I try to stay out of the "climate change" debate here, because I know it goes nowhere, but this is worth a read. I received it this morning from Don Garber, a friend who has spent his life working for NASA at the Langley Research Facility. He related this as some of the most recent studies in oceanography. The losses of oxygen are serious. How is oceanic oxygen related to / intertwined with atmospheric oxygen? Now there's a good question to pose to a bunch of random Baptists. Snowfall in general, and lake effect snow fall along the Great Lakes in particular, are precipitation events, not cold events. Increased snow isn't produced by increased cold, it is produced by increased moisture content in the atmosphere. In fact increased cold means less snow and not more. Anyone in Iowa knows that. Our winter pattern is that it snows at around 30-32 degrees and then we drop into the deep freeze near zero or lower. Then it warms up close to 30 again and it snows again. Years in which we have a more cold winter than usual are usually dryer and have far less snow than a "warm" winter. When we get "warm" winter we get dumped on as to snow. For you all in the south, it is 42 to here today so, I'm just wearing a light jacket outside. We had temps well below zero so it feels like a heat wave. Dave Roberts wrote: I try to stay out of the "climate change" debate here, because I know it goes nowhere, but this is worth a read. I received it this morning from Don Garber, a friend who has spent his life working for NASA at the Langley Research Facility. He related this as some of the most recent studies in oceanography. The losses of oxygen are serious. The so-called “arrogance” of the climate scientists that Jim and David belittle (see their posts above), is really their own arrogance and overtrust in RW pundits (Breitbart), and anti-GW websites (Climate Depot, WUWT, Heartland and other fossil fuel funded pundits). I think I’ll give much more credence to Scripps Institute of Oceanography and their scientists - e.g. Denise Breitburg (lead author of the Scripps Institute article that Dave references)- than to Breitbart that David offers up a few posts above. Digging into those sources, I see good references and plots/maps of oxygen depleted oceans in the Scripps study, published in the highly respected Science journal Jan 4,2018. Meanwhile I see that Breitbart piece does not even reference the source of Jonathan Overpeck supposed statements (which I searched for but did not find). Wouldn’t be the first time Breitbart just fabricated stories to rally the RW base built up over that last 30 years of breeding suspicion and ignoring DATA (be it on global warming, economics, guns, white supremacy, immigration ...). To Jim and David, read some other non-punditry, scientific studies and look at the DATA! I’ve given up bothering to bring that DATA into your sight; you trust your pundit-driven sources or wishful thinking or sour attitudes more than the scientific DATA. Global warming has not yet eliminated freezing temperatures (and will not for centuries if ever). Thus snow events occur when freezing temperatures and available moisture in the atmosphere coincide in time and space. Snowfall in general, and lake effect snow fall along the Great Lakes in particular, are precipitation events, not cold events. Increased snow isn't produced by increased cold, it is produced by increased moisture content in the atmosphere. Lake effect snow along the Great Lakes happens in late fall and early winter, when the air temperature is warmer, and the majority of the water in the lakes hasn't frozen. The record lake effect snowfalls of the past decade or so have all been due to lake water temperatures warmer than normal, and air temperatures warmer than normal. This allows the atmosphere to absorb a greater amount of water vapor, and produce greater amounts of snowfall in the snowbelt areas along the lakes. The temperatures and snowfalls aren't "events that have occurred countless times before." The recent events are records, and significant ones at that. Haruo wrote: How is oceanic oxygen related to / intertwined with atmospheric oxygen? Now there's a good question to pose to a bunch of random Baptists. The article works from the premise that the single largest source of planetary oxygen is the oceans, not trees as we have often been led to believe. The health of the oceans is the measure of the health of the planet. The most damaging reality to the oceans is the amount of nutrient runoff, both from agriculture and from wastewater treatment. We, in man ways, are reaping the carelessness and callousness of the days when sewage from large cities like Boston and Miani was simply piped half a mile off shore and released into the ocean. I also remember when my hometown used the creek that flowed through the town limits as an open sewer saying that the water would clean itself by the time it reached the larger river ten miles downstream. That was our real arrogance, and change was forced only in the 1950's and 1960's when government began forcing the cleaning up of such practices. You would be well-aware of the fact that I DO look up a great deal of DATA and present the sources for much of what I post if you bothered to read what I post. 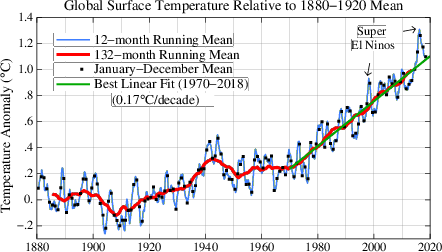 What I've discovered about DATA is that certified “peers” read the same data and arrive at wildly different conclusions, mostly agenda-driven, just like yours since there has been virtually no change in climate (at least temps) for two decades other than anecdote-driven, as is the case now with the serious cooling at least in the U.S. eastern half. Item: Arctic ice volume has been diminishing while Antarctic sea-ice (the ices are quite different in nature) has been increasing in volume for some time now, each somewhat neutralizing the other as far as climate-effect is concerned. Concerning DATA is also the fact that the “garbage-in, garbage-out” rule is always in effect. The UN-IPCC gang of 2009 exposed their subterfuge regarding data and its analysis by unequivocal guilt-admission. Their precious computer models (hockey-stick, anyone) held no solid info prior to the last 100 or so years, if that, and using tree-trunk-rings to explain climate-effect for the last computer-lack thousands of years is laughable. More to the point, the current alarmists have decided what the climate OUGHT TO BE, never mind the opinions of people in Greenland and Finland as opposed to those in Florida and Brazil (or God), and that PEOPLE, not just polar bears and penguins are a part of the total Creation and deserve some consideration by the oracular Ph.Ds using their charts. Here is the global (non-anecdotal) record of the data from two sources. Satellite data (lower troposphere) since 1979 with an upward trend of 0.13C/decade. Ground global grid thermometers since 1880 with an upward trend since 1970 of 0.17C/decade. The temperature rises are more than just anecdotal (they are pervasive across the US at least). Also these global rates of change over comparable duration data (in Vostok data) are at least 6 time the rates of temperature change over the 445,000 years of the Vostok data. That is one reason why the majority of climate scientists are alarmed. Climate/weather related disasters ($1B or more disasters) have increased by a factor of about three from 1980 to 2013. And 2017 saw the highest ever weather related disaster damages at $306B with 362 deaths (people, not polar bears) in the US alone. That is 50% more than any previous year. I can understand your feeling that changes of 1.2C = ~ 2F may not have affected your life significantly. But think about the 15 people killed and 200+ people still trapped in California mudslides (caused by high precipitation) over a wildfire-decimated area (caused by drought and high temperatures) or the Puerto Ricans who still have only 40% in power (enhanced by high ocean temperatures the east of Puerto Rico). Yes we have had hurricanes in the past and they will continue to occur. But globally, climatic disasters (with greater than $1B in then-year damages) are increasing. This is not using “computer models” of the future. Neither has the so-called hockey stick used computer predictions of the future - just past DATA that always shows that hockey stick form no matter of the data preprocessing employed (which did affect the shape of the long handle but the blade over the last 100 years remains - and that is the point Michale Mann, etc were making). I've avoided these climate topics because, basically, I agree with Keith's analysis every time I've looked at it. But even given that, what makes the anti-climate change side so anti-climate change? None of the steps that those who see climate change as important if taken would hurt the earth yet if the 97% are right, we are really in trouble if we don't make changes. I don't see the downside in reducing emissions, etc. Many of them would make our world better (less pollution etc. ) even if you don't believe in climate change.